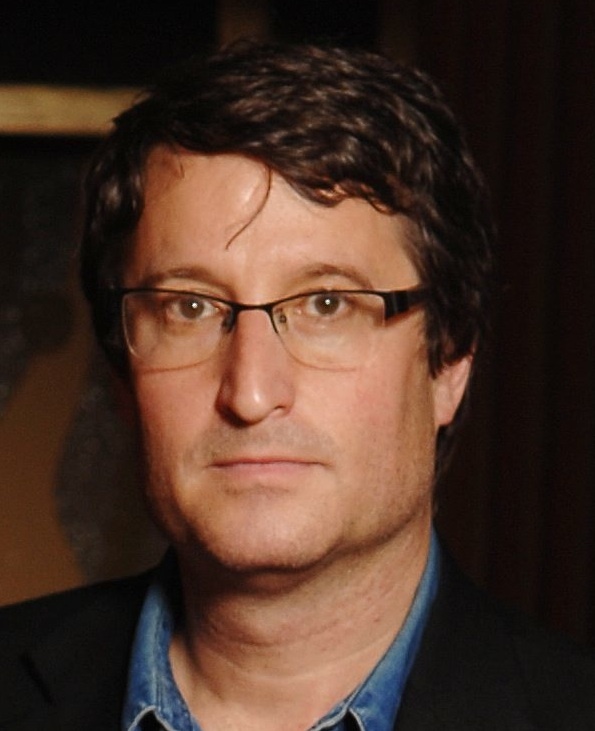 Tom Block is an author, playwright and artist. In his last 34justice guest post, Tom described Niccolò Machiavelli’s influence on American politics. He also laid out his proposal for a “Moral Ombudsman,” a nonprofit that would “offer a true moral center from which to judge the legislation and actions of” politicians. In this follow-up, Tom explains three specific policies a Moral Ombudsman might recommend. Twentieth-century political theorist Hannah Arendt said of her friend Walter Benjamin (a philosopher and social critic) that he was a “clumsy theorist.” Not that he couldn’t theorize and walk at the same time, but that he was only interested in developing theories which couldn’t be implemented, in the messy world of the public square. I share this clumsiness with Walter Benjamin, and so I am transforming the theory for my Moral Ombudsman – proposed in my last posting in this space – into three very real proposals to begin implementation of this anti-Machiavellian political program in the rough-and-tumble world of contemporary American politics. Though these ideas might at first appear heuristic (theoretical or exploratory), they are in fact common sense responses to some of our most pressing social challenges – and ideas which could be implemented at the local, state or even national level. My fascination with the socially binding attitude toward war was heightened while watching the build-up to America’s incursion into Iraq in 2003. An “adventure” which still haunts our economy and foreign policy today, more than a decade later. My morbid attraction to the subject led me to write a book, A Fatal Addiction: War in the Name of God, which explored the conflation of war, spirituality and the state. It investigated not only the religious language used in fomenting war fever in the country, but also the reasons why this framing of this deadly form of politics (which often amounts to genocide) resonated so successfully with the general public. I also realized how ubiquitous war is, both in the United States and throughout human history. By one count, the United States has been at war during 214 out of our 235 calendar years of existence. Hardly surprising, however, when you learn that throughout the past 5600 years of recorded history, 14,600 wars have been fought, more than two wars for each year of human “civilization” (p. 17). The American addiction to war has many causes: psychological (situating the generalized anxiety we feel inside in some far off “other” and then destroying it); economic (at least 50% of the American economy is dependent on the military-industrial complex) and political (nothing brings a population together or rallies them around a leader as does war). As such, stemming this gruesome tide might appear nearly impossible. However, for our psychic as well as social health, it makes sense to do everything we can to phase this activity out as a political option. To this end, there is one simple legislative proposal which might help stop, or certainly slow, the pace of American wars – and if adopted throughout democracies and republics worldwide, could do much to stanch the bleeding around the globe. If politicians were forced to vote a single member from their own immediate family into war at the head of the army, they might think twice about casting that politically expedient vote. From Bill Clinton’s (42nd President of the United States) daughter Chelsea to President Barack Obama’s (44th President of the United States) daughters Malia or Sasha to one of George W. Bush’s (43rd President of the United States) twin daughters or even Senator Mitch McConnell’s (R-KY – at this writing, the Minority Leader in the US Senate) children: we could do much to lessen the rush to war if the vote was modified in this manner. By personalizing the vote for bellicosity, the noxious pattern of sending other people’s children (usually from the underclass, as the armed forces often provides the best employment option for those who have few of them) to die for our country might be halted. While it is easy for the rich and powerful to send unknown bodies off to other lands to be psychically or physically maimed, even politicians might think twice about involving their beloved kin. And if a particular representative didn’t have children? A sacrificial brother, sister or first cousin would suffice. This simple law would allow even the most stolid of politicians to appreciate in its entirety what it means to go to war. Not to say that all wars would be stopped – World War II, for instance, might well have been fought under these pretenses – but the succession of wars of choice that we have entered (and often instigated) over the past 75 years (currently numbering 18 and counting) would have been considered far more gravely beforehand than they in fact were. My Father (b. 1933), drafted into the army as all of his generation and then recalled during the Cuban Crisis (1961-62), tells many stories about his experiences there. In particular, he relates how people from all strata of American life came together to live in the shared cultural environment of the armed forces. Living as equals, these men from rural, suburban and urban America, some toothless and poor, others headed to Ivy League colleges, shared an experience for months, a year or more which would stay with them for a lifetime. Most importantly, it deepened their sense of the American community as one which involves people from all walks of life, even though they might have disparate political and social views, as well as economic prospects. This sense of a national citizenry – in which all Americans got to personally know people from every segment of our society – has been lost with the passing of the draft. In my opinion, much of the political and social fracturing of our country that we have seen over the past two decades might be due to this loss of shared experience. We no longer get to know each other as equals, in a common American endeavor. Community members from the rural South to the urban Northeast have grown insular, identifying more with their local culture than with the country at large. And as our political life has suffered, our social discourse has soured and the answers we so desperately search for concerning everything from global warming to unemployment have become more and more difficult to come by. I do not advocate reinstating the draft. As you can see from my first idea, I am far more in favor of fazing out the standing army, rather than getting more Americans to serve in it. However, I do strongly feel that we need some kind of national program to help knit our American community – far more diverse now than when my father was in the army fifty years ago – together into a singly polity. I propose a democratizing event that brings all segments of our society together. A year of national service concentrating on public and social work – from environmental cleanup to light infrastructure jobs to helping the poor in cities or rural areas where there is need – would reinstitute this shared sense of American community. Taking place for one year between high school and college, and perhaps modeled on an existent program like Americorps, Teach for America or even the Depression-era Works Projects Administration (WPA), this endeavor would help heal the fissures that have been appearing in our culture, and threaten to grow from cracks into chasms of difference between disparate segments of our population. Not only would young adults at a formative time in their lives come to feel the warmth of working for the common good, they would also be forced to work with and perhaps even befriend people from different socio-economic, religious, ethnic and geographical backgrounds. This would do much to combat sectarian, economic and racial rifts that have yet to be healed (and sometimes seem to be on the rise) in our society. One of the unfortunately, though rarely remarked upon, concerns with our democracy is that such a small percentage of the voting age population votes in elections. In presidential years, a bare majority of Americans vote – not even 60% of the voting age population in recent elections (since 1960, the percentage has ranged from a high of 63% in 1960 to 49% in 1996). In off-year elections, known colloquially as “midterm elections,” a little more than a third of the voting public casts ballots, allowing only a 20% minority of voting age citizens (the majority of those voting) to make decisions that affect the whole country! According to Howard Stephen Friedman (a professor at Columbia University and economist at the United Nations), the USA trails virtually all advanced democratic, economically healthy nations in voter participation. 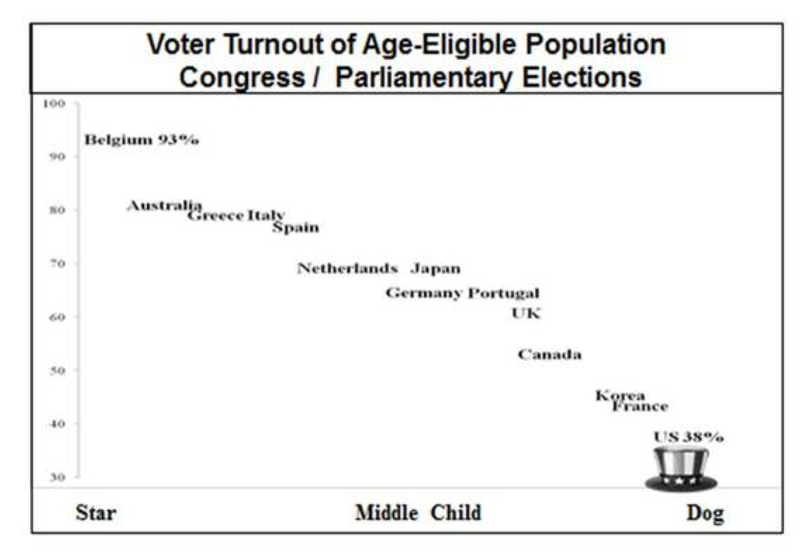 According to his graph, the United States of America lags far behind Belgium, Australia, Italy, Greece, Spain, Korea, Portugal, Japan and many other industrialized nations, coming in with a paltry 38% of eligible voter participation, on average. Different countries address voter participation concerns in different manners. Unfortunately, in our country, legislative energy has recently been expended in depressing voter turnout even further, rather than encouraging it. One party has realized that the majority of Americans do not agree with their political program, so the surest way to electoral victory is to make it more difficult to vote, not easier. For the first time in decades, voters in nearly half the country will find it harder to cast a ballot in the upcoming elections. Voters in 22 states will face tougher rules than in the last midterms. In 15 states, 2014 is slated to be the first major election with new voting restrictions in place. These changes are the product of a concerted push to restrict voting by legislative majorities that swept into office in 2010. They represent a sharp reversal for a country whose historical trajectory has been to expand voting rights and make the process more convenient and accessible. American democracy should not be about inventing fraudulent, though “legal” (in the narrowest sense of the word) means to assure electoral victory. We should work toward the kind of voter inclusion of Belgium (93%) or Australia (80%), instead of being satisfied with a little more than half of a bit more than a third of our voting age population making decisions for the whole country. To this end, I propose not only making access far easier, but also moving the election day to the weekend (or declaring it a national holiday); having voting laws administered by the Federal Government (instead of a patchwork of state and even local jurisdictions, allowing partisan election judges to make, shift and change laws to the best effect for their political party) and even go so far as to – like Australia or Belgium – pass a law making voting in this country mandatory, instead of attempting to restrict it to partisan friends, while discouraging others from participation. Democracy (a system of government by the whole population) cannot be healthy if certain segments of the citizenry are discouraged or even prevented from voting. Current election tightening – something, that Weiser assures, hasn’t happened on this grand a scale since Reconstruction, more than 125 years ago – is bad for the country, though certainly better for one of the major parties. We must take the ballot box back for all Americans. Twenty two countries in the world have some form of compulsory voting, including much of Latin America, Australia and Belgium. The State of Georgia (USA) had such a law on its books in its Constitution of 1777 which stated: “Every person absenting himself from an election, and shall neglect to give in his or their ballot at such election, shall be subject to a penalty,” though it was omitted from the State Constitution of 1789. A participatory democracy must include the voices from the vast majority of its citizens, even if their voices are compelled to speak. If we, as a country, can pass laws to narrow the vote, then we can just as assuredly pass one that will compel it. And if we truly want to live in a “democracy,” we should do it sooner rather than later.